Waze is a new mobile social application which provides maps, real-time traffic updates, and turn-by-turn navigation directions for mobile phone users. What’s interesting about this application is that it uses crowdsourcing to deliver both the map and traffic updates. When launching the app, you’ll see an onscreen map which looks very much like any map in any other application. However, Waze’s dynamic map is created and constantly updated by its users who leave the application open while they drive. 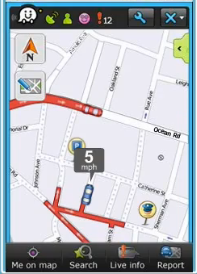 Using the phone’s GPS, the service learns where the roads are and this information is uploaded to the Waze.com website. There, members of the Waze community can make improvements to the map, adding in street names, fixing errors, and more.